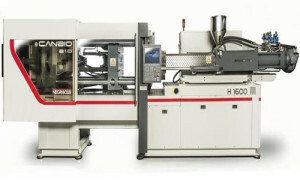 At NPE 2015 , Italy-based Negri Bossi will exhibit four injection molding machines for multi-material, equipped with a Sytrama robot. First, a 330-ton Vesta press will be equipped with a four-cavity mold for the production of clothes hangers using a gas injection system, and with a new Sytrama S9-L robot. A 60-ton Eleos machine will instead be set up with a single-cavity mold for the production of zip-up storage cases for sunglasses. Negri Bossi said this two-platen machine combines compact overall dimensions with a generous space between the tie bars and it will be equipped with the new Sytrama ONE-L robot. It will demonstrate automation of a standard injection process in which the handling equipment is set up to pick up and place the moldings. The flagship Canbio Evolution series will be present in the form of a 300-ton machine equipped with MuCell foam-molding technology and the new Sytrama S9T-L robot. Last but not least, there will be a 210-ton Canbimat multi-material machine equipped with a second vertical injector and a rotary table for the production of a two-color container. In this case too, the Sytrama S7-L with a special support will be incorporated in the technical equipment.